Red suede shoes? Why not — Elvis and Carl Perkins would have flipped for these, I’m sure. It took me several days of peeking inside the Vendramini box to get up the nerve to actually try them on, but judging from the reactions I’ve gotten from others, they’re a hit. It’s funny how style works — someone, somewhere had to be the first person to wear a white belt, a double-knit polyester leisure suit, pants with the crotch hanging down a foot from the nether regions or a white T-shirt five sizes too big. The first person to wear it can sometimes look as foolish as the last person. But trendsetters are always experimenting and the rest of us follow. If this sounds like a long-winded justification for wearing red suede shoes, well, maybe it is. 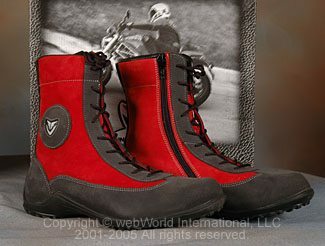 Although I’m not sure I need a justification, because these Vendramini Aero boots not only look cool, they’re comfortable too. Besides, if you don’t like them in red, try the muted gray, and they’re also available with “Air-Tex” vented fabric, which would probably be perfect for summer. I’ve been wearing mine on the street, and getting lots of compliments (and stares). But they’re motorcycle boots nonetheless, with the same lateral crush resistant bottom used in all Vendramini boots, just like the Vendramini Marathon boots we reviewed previously. This type of sole is important and useful for motorcycle riding, because it helps prevent torsion in a crash and because the stiff and stable platform formed by the sole provides a greater amount of surface area to distribute the rider’s weight over the narrow footpegs, helping to decrease stress. 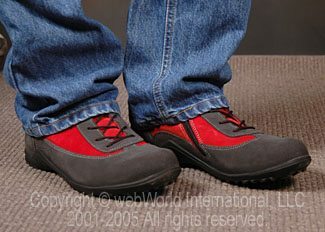 The Aero boots have a stiff heel cup and protection in the toe and the outer ankle, so they should offer better protection than work boots or other footwear not specifically designed for motorcycle riding. The cool-looking Vibram soles are very sticky, again just like the Vendramini Marathons. Sticky soles are best for motorcycle riding because they help the rider gain better traction when paddling the bike around in a parking lot or backing it into the garage. This is doubly important for riders with shorter inseams or those riding tall bikes, like our Triumph Tiger test mule. 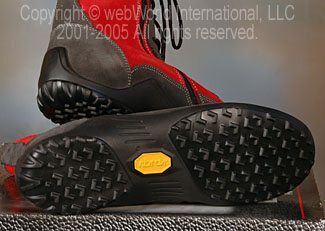 The Aero boots are very comfortable; sort of like wearing a work boot with a rock climbing sole. The insoles are leather and they have a natural coconut fiber cushion, of all things, which provides some give and which also has some insulating properties, according to Vendramini. Although the boots are comfortable for walking, they’re not meant to be as cushy as running shoes. They are instead more similar in feel to a pair of work boots. I normally take a size 10.5 (US) street shoe, which corresponds to a Euro size 44. The Aero boots shown here are labeled as size 10, but they have a size 45 marking on the insole. The Vendramini USA website lists sizes 7 to 11, with no half sizes. These size 10’s weigh 1 lb., 6-1/4 oz. each (631 grams). It’s been tricky lately to determine the country of origin for many motorcycle products lately. You’d think there’d be law that mandated a “Made in…” label, but I guess this isn’t the case. I’ve inspected every square inch of the Aero boots and the box they came in and I can’t find anything that indicates where they are made, but if I had to guess, I’d say that they’re made in Italy. The contrasting dark gray suede leather around the bottom of the shoe is sewn with contrasting double-row stitching to the red suede tops. The quality is first-rate, and everything looks perfectly lined up with no hanging threads or other nits to report. The Vendramini Aero boots have a dual entry, using laces and a YKK side zipper. This may seem strange at first, but it makes sense once you try it. The zipper makes them easier to put on, and they can be securely fastened to the owner’s foot, which is important, because a boot will not protect if it flies off in the violence of a crash. To put them on, I first loosen the laces and then open the zipper. The boots seemed like they might be too narrow at first, but they fit my D (average) width feet perfectly. They’re slightly tight at first but have broken in a bit over time, and I’d rather have them too snug than too loose. The Vendramini Aero boots look great with jeans. They’re nice to wear on the bike or on the street, and if you want to stand out from the crowd, get a pair in red.